A blend of Instant Coffee, Finely Ground Roasted Coffee Beans with Skimmed Milk Powder and Vegetable Oil. 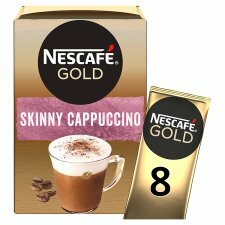 The coffee beans in our NESCAFÉ Cafe Menu Cappuccino Skinny are prepared by experts for a great-tasting cup every single time. Enjoy the milky taste and flavourful coffee with every sip, no matter when you fancy a break.